As I mentioned in my introduction thread I'm in the process of creating The Candleford Green Light Railway. After a years worth of false starts, distractions & failure of friends to come good with offers of help ground has been broken & construction is proceeding in a way I can do on my own & can adapt, develop, extend or demolish fairly easily. Construction is deck boards raised off the ground on fence posts set into the cheapest met post copies I could find. An unavoidable factor of this build is that the budget is non existent. 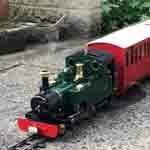 When I initially purchased my Lady Anne there weren't any plans beyond running on a 16mm society layout. However it didn't take long before thoughts turned to a test track in the garden & from there the CGLR was born even though the piggy bank is distinctly empty. So this is where we were a few days ago, the basic structure is in place for phase I, a simple distorted dog bone loop with a straight run up the fence line which will be a run through a corridor of greenery before heading back towards the house on a more sinuous route hopefully planted & landscaped to give a reason for the curves. Immediate concern are whether the battens under the long spans will prevent sagging & whether the unsupported joins on the curves will hold up. They are glued a screwed & have already survived two 11 year olds running round the track, , when my back was turned so I guess only time will tell. Great start. Don't know how you resisted putting some track down. With the right planting you will be surprised how good you can make that simple design look, keep going. Welcome Paul and congratulations on the start of your railway, the setting looks great and your plans will make it look good once established. Your concerns about construction may be justified as the decking timber is treated so as not to absorb moisture, including adhesive, so the bond will not be permanent leaving only the screws. At this stage, before track is laid, it would be advisable to add more strength between the unsupported sections as it will be much more difficult later. I hope this is useful and something is possible within your budget. Edit.... If you have any off-cuts of the decking longer than the ones you have already used it would be a good idea to replace them and use coach-bolts instead of screws, these have rounded heads so will not stick out too much, or can be countersunk. Also, large washers on the underside will spread the load. These should be placed a distance away from the joins to give maximum strength. Thanks for the comments & particularly the advice from Peter. I wasn't aware of the glue not penetrating decking Peter & so will give thought to other ways of strengthening the joins & being honest I had already experimented with coach bolts & longer plates as a way forward if/when required. Being honest I know I've already made some mistakes because I got fed up waiting for assistance & charged off down this route doing most of the work late in the evening to fit in around work, family life with & hospital visits. Because of that I know it isn't the final solution but hopefully won't be a totally disastrous start. The earlier pictures were from a few days ago & this is where we are now after some twilight track laying & painting to get rid of the god awful galvanised colour of the posts. 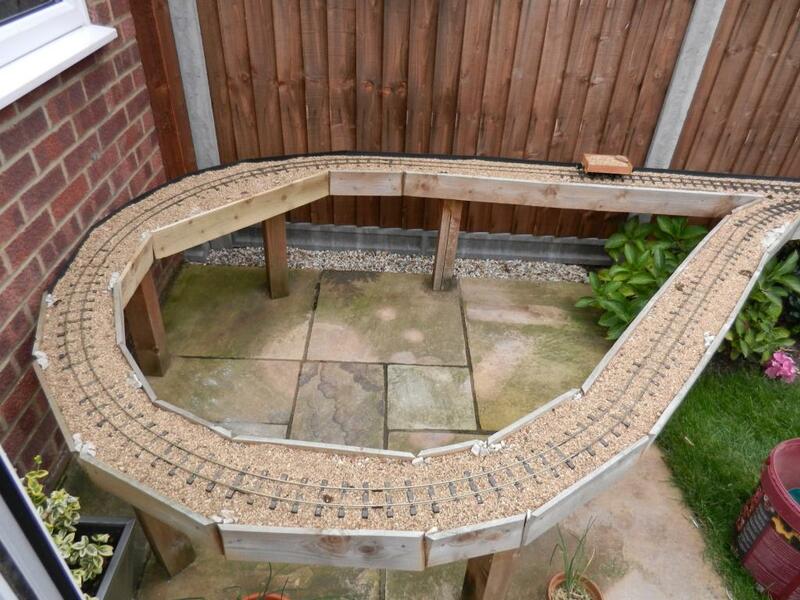 There is a simple and reasonably cheap way of adding extra posts under the existing track bed. 1) Get a length of 100mm sq plastic downpipe (brown or black). 2) Cut a piece the height that that you need PLUS about 9". 3) Screw a timber cross bar to one end, the width of your track base. 4) Dig a hole about 12" deep by about 12" diameter. 5) Get a bag of "Postcrete" and fill the hole about 9" deep with the dry mix. 6) Push the post into the dry postcrete and wiggle it, so that some goes up the inside. 7) Fix the crossbar to the track bed. 8 ) Pour water into the hole to soak the postcrete. 9) Wait 20 minutes and back fill, job done! Note: the Postcrete instructions say put water in the hole and then pour in dry Poscrete but it works the other way round as well, because we aren't putting tremendous strain on it in this application, its just to stop it sinking. Paul I think you may be worrying too much if your kids have jumped about all over it then it should be fine. That's pretty much the construction I've used for a lot of my track-bed. I used ash poles rather than fence posts because I happened to have a lot available. You've obviously found that it's all plenty stable enough laterally, you just want to add some additional support under the longer spans. I have my posts around 2'6" - 3' apart, but only every second or third is fixed into the ground. The intermediate posts just have a dowel peg in the bottom to locate them. I 'pounded the ground where they sit and then they are secured with three screws through the decking. The longest span I have is a 5' lift out section which is braced underneath with some Dexion (other big boys meccano is available). My original plan was also using blocks but as time went by I realised that there was a good chance of me never actually getting the groundworks started let alone completing anything which is why I changed tack & went down this route. I don't come from a practical family so I appreciate where you are coming from.